I have been making beaded jewelry for years..and usually start way in advance of the holidays making it. 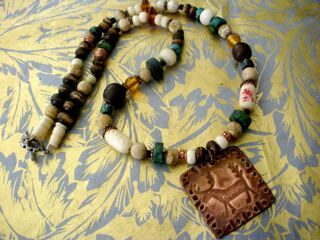 Along with my ethnic inspired earrings, necklaces and bracelets. 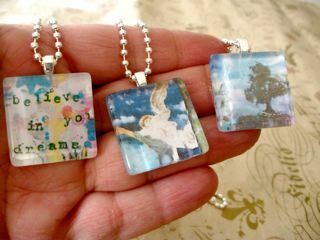 I have started to create a line of Fine Art Wearable Pendants, that use my own art as well as images that inspire me. I have been having soo much fun, I love making multiples of things. making a whole new line of jewelry. 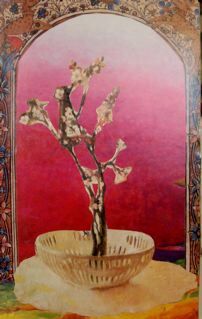 this is a reduction of an original encaustic painting of mine.. But... I am having an open studio with all of my jewelry and art along with 2 artist friends of mine...Susan Adler...who does such vibrant paintings, they take my breath away. And print maker Rob Duncan, whose work is stunning. 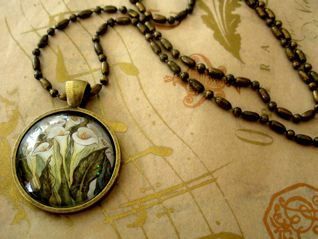 Join for some holiday cheer and support local artists when doing your holiday shopping. It has been almost a month since I last posted anything here. I've been busy, playing around with making paper dolls, cutting out images from magazines for my SoulCollage® workshops, experimenting with more CitraSolv backgrounds, and finishing this mandala...among many other pursuits. I struggled with this mandala quite a bit, as I worked on it, feeling that the sun color wa too dominant....and at times wishing I had just left the drawing in black and white, or at least left more black in the drawing. But Patricia suggested I bring more of the orange of the sun into other parts of the image and in so doing I finally came to resolution with it. Unfortunately, none of the other participants from the Fall Mandala Retreat, sent me any images, so I am posting this alone. By the way, we are doing a Gratitude Mandala Workshop on Novemeber 12th in Santa Rosa, if you are in the area and are intrigued with this wonderful art process. Contact the Journey Center for more info. While I am at it, I mentioned that I had been playing with making some paper dolls. I do art mentoring with several little girls and since I planned a paper doll lesson, I pulled out some color copies of my art and turned them into my own version of paper dolls...just for the fun of it and as examples of paper doll possibilities. The little girl I work with, of course took off on her own unique way of expression, but I had some examples of my own to share with her. Talk about fun. Here are the ones that I did, all in differing stages of becoming complete. This one is not complete yet, and her face is collaged from a photograph of me as as little girl. Again, all are still on process. It is so fun to do this and it made me remember how much time I loved to spend cutting out paper dolls when I was a little girl. No wonder I love collage so much. One final thing... here is a link to a clip from a movie called "Praying with Images"
Here are the process photos of the Tree of Life Mandala Workshop that we led last Sunday. I love to the witness the process people go through during these mandala experiences. 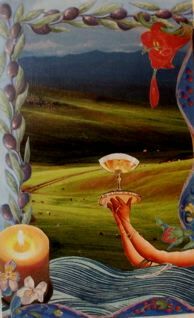 This image is of our beginning small mandalas where we practice the scale of light in a circle. We always stop and put them up on the wall, to get a better overview of what we have done, as well as to stretch, and rest our eyes. It helps to stand back from one's work. Here is an image of everyone drawing around the large tables in the middle of my studio. It was a wonderful group of people, with such good energy. The following photos are a sampling of everyone in the midst of starting their larger mandala. Although our focus was the Tree of Life, everyone had permission to go in their own personal direction in their mandala. This mandala was an honoring of the hope of the one tree that was left after the tsnumani and earthquake that happened in Japan. Another Tree of Life Mandala. Keeping the pencils really sharp really helps in this drawing process. It is always amazing to see what emerges for people in their mandalas. By the afternoon we did some color blending exercises to give people the courage to dive into color. Here are some more of the black and white mandalas......I am sharing the evolution of pretty much everyone's mandala's here. I love to see how they change as more and more scale of light shading brings depth, light and life to them. It is often difficult at times, to add color to these powerful black and white mandala's... some people really hesitate and it is not uncommon for some folks to either love or hate these first tentative steps into adding color. It is amazing how different each one becomes, and how unique everyones use of color is. Only one person completed their mandala that day, everyone else was in different stages of the process. This is a slow and meditative process, about being in the moment with what is coming up internally, as well as how it is mirrored in the mandala that is drawn. This is Doris's powerful healing mandala, here sharing was a rich and deep model for where the mandala process can lead. This final mandala is my Tree of Life Mandala in different stages of development. I am now just beginning to add color to my mandala and I will share it here when it is complete.